ACT (Action for Children of Today) gives disadvantaged girls and boys ages 7-15 an opportunity to develop themselves, reach their potential, and improve their psychosocial well-being through a varied and rich informal educational program.Through intensive English classes, IT, art, drama, music and conflict resolution, children are given the chance to succeed in school, while improving self-expression, confidence, understanding of others, and their ability to peacefully solve conflicts. ACT is supported by FutureFirst – HSBC. CIRCLE: The main aim of CIRCLE is to bring children and youth together and provide them with psychosocial relief, education support, and skills to use in their academic and personal lives. In all its activities, CIRCLE II focuses on developing conflict resolution, team work, and communication skills, while increasing confidence, self-expression, and respect for others. The program is divided into sub-programs such as: Team Sports Camp – sports training, matches, and workshops; Artists and Actors – music, art, drama, and workshops; Frame by Frame - building social cohesion and sustaining culture through film; Young Learners – informal education including stories, tablets, indoor and outdoor play; Most Outstanding Mothers – English, IT, and awareness sessions; Together Let’s Code – coding and computer sessions for girls; Chorale – singing and music lessons culminating in a choral performance; Sununu - employability empowerment for women; Training of Trainers – empowerment for the caretakers of the children in our programs. Funder: UNICEF. Harmony: No to gender-based violence (GBV), yes to living in harmony. Through drama therapy and team-building activities, the program promotes healthy relationships, exposes youth ages 16-21 to the causes and effects of GBV, and shows them that harmony between genders is the only way to create a better future. Harmony draws on the credibility that young people have amongst their peers and leverages the power of theater and films to provide messages to the youth of today, by the youth of today. Funder: Canada Fund for Local Initiatives. Skills4Life: targeted students ages 8-18 who were at risk of dropping out of school. It included a variety of classes and activities designed to encourage them to continue studying and achieve their goals. Students participated in drama, music, art, English, IT, and sports sessions, offering a creative escape and time for reflection. They also took part in entrepreneurship and financial literacy, in order to improve their future prospects.Skills4Life targeted 1,000 Palestinian students and their 40 teachers over a period of two years. Funded by the European Union and implemented in partnership with the Welfare Association and INJAZ Lebanon. United by Environment: The environment does not discriminate between us; why do we? United by Environment helped students ages 14-18 ‘up-cycle’ waste and recyclables through research, lectures, discussions, and hands-on creative activities. They created environmentally sound designs, such as water heaters that run on solar power and vehicles that run on wind power. Additionally, the students disseminated what they learned using short videos that invited their peers to unite for the environment. Funder: U.S. Embassy Beirut Small Grants Program. 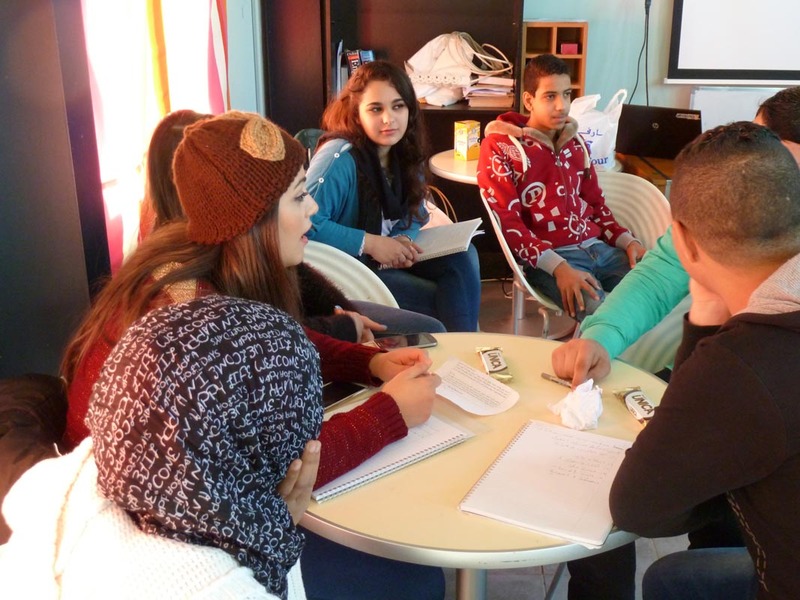 Frame-by-Frame: Creates dialogue between youth ages 15-22 from different backgrounds in Lebanon, by promoting and exchanging understanding of their own and others’ cultures. Funded by the European Union. SAWA (Strengthening Amity With the Arts): Children in the SAWA program learn about and produce art, drama, music, and mosaics. By working together creatively, acceptance, honesty, respect and human rights are addressed, and these new skills are put into practice. The first SAWA was held in 2011 and was part-funded by the United Palestinian Appeal (UPA). Football for Friendship: Children ages 8-18 play football and learn new techniques about team work, cooperation, understanding and respect for others. Boys and girls are challenged to excel physically and mentally on the field, and encouraged to translate new skills and values into all aspects of their lives. Together in One Basket: Young people improve their physical abilities and learn new basketball tactics, while developing teamwork, cooperation and leadership skills. #Respect: Empowers and enables youth ages 16-22 to engage in conflict resolution activities, and to embody and promote the values of acceptance and tolerance in their communities. Participants created videos to share the message of #respect with their peers. You can watch the videos here.